This is the first time I have reviewed a stuffed toy. Generally they're not something I really buy, many of them are pretty identikit cute representations of various human characters and I'd generally rather buy figures due to the higher level of detail they have. However, occasionally even I'm swayed by a plush toy, and this is one of those times. I like the idea of stuffed toys of Pokémon, considering they're pets in the series stuffed toys seem the ideal merchandising medium for them. The main problem with buying them is that apart from the few available through larger toy retailers like Toys R Us, it's really hard to find the real ones in the UK. Most of those available through anime retailers at trade shows are poorly made bootlegs, and only a handful of retailers sell the officially licensed ones. Neon Martian are one of those retailers who do get the real ones in, albeit only a few at a time, and over the last couple of years they have carried stuffed toys of everything from Pichu to Darkrai. Few of these ever grab my eye, but occasionally they do bring over some of the more unusual Pokémon. Pokémon, having few powers in the original game and spending a lot of the time in the anime hiding in another dimension. They do have a big part to play in the third Pokémon anime film though. 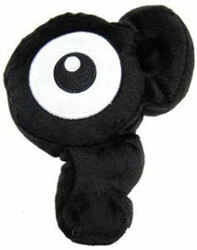 Unown are psychic Pokémon which take various forms based on the letters of the alphabet, and usually cluster together in groups. 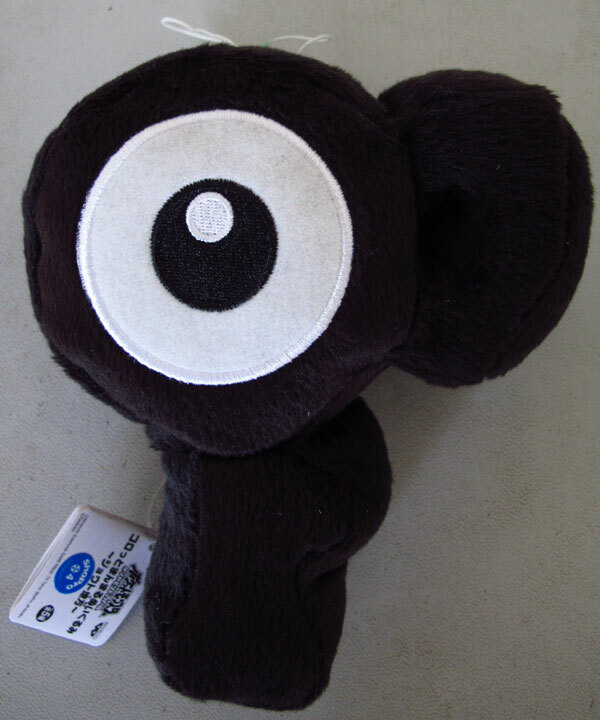 The plush is approximately 5" tall and is covered all over with short black fur, the only exception being the single eye which is a basically a patch tightly sewn to the front of the toy. The stitching is neat and tight all the way round, with no sign of loose seams or fraying and the toy is well stuffed and suitably plush and soft. so it's a little disappointing that other designs aren't available to allow you to replicate that. However, the toy is still instantly recognisable and in reality buying 24 different ones would be pretty expensive, so it's probably for the best that Banpresto didn't make them. In fairness what attracted me to this toy was the sheer randomness of the Pokémon depicted. There are literally hundreds of different Pokémon designs and with so many more conventional ones to choose from I love the fact that Banpresto have made a toy of one of the most obscure creatures in the franchise. It's got a charm all of its own because of this, and it is both well made and pretty damn cute too. Obviously these kinds of thing aren't for everyone, but its designs like this that turns heads and if you're waiting for them to do a Mr Mime plush this could be the perfect thing to tide you over! The toy was originally intended as a prize for Japanese arcade machines, and as such has a string loop attached to the top of it to hang it up with. Other than that there's a tag with Banpresto's copyright info on it. Not much else you can really add to a toy like this.